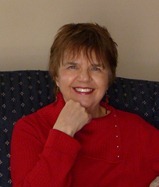 I’m pleased to welcome to TKZ my guest, Jodie Renner, freelance fiction editor and craft writer. 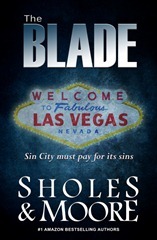 Jodie is currently editing my next thriller THE BLADE (co-written with Lynn Sholes), soon to be released as an indie published e-book. Not only is she doing a great job of finding all our line and copy edit stumbles, but she’s got a keen knack for suggesting just the right content tweaks to help tighten the story. I asked Jodie to put together some thoughts and tips for writing action scenes. Here’s her terrific post. Enjoy! Thanks, Joe! Great to be here. I specialize in editing thrillers, and I sometimes get asked how editing suspense fiction is different from editing other genres. That’s a huge topic, too long for one blog post, and would include specific approaches to various elements like premise, plot, characterization, pacing, word choice, and writing style. For this post, I’ll just talk about writing effective action scenes, which can appear in many other genres besides thrillers. When your characters are running for their lives, or your hero is in a race against time to save innocent lives, it’s time to write tight and leave out a lot of description, especially little insignificant details about their surroundings. Characters on the run don’t have time to admire the scenery or décor, start musing about a moment in the past, or have great long thoughts or discussions. Their adrenaline is pumping and all they’re thinking of is survival – theirs and/or someone else’s. Of course, if the details of the setting are significant or would somehow help or hinder your protagonist, then definitely include them. Basically, put yourself in the head and body of your character under stress, fighting for her life, and see/hear/smell/feel what she does, then react as she reacts. ~ Show, don’t tell (of course!). Play the scene in real time, with actions, reactions, and dialogue. ~ Use deep point of view. Stay in the POV character’s head and body. ~ Avoid info dumps. Keep the readers right there in the scene with the characters. Don’t intrude as the author to clarify anything. If details need explaining, fit that in somehow before the tense scene starts. ~ Evoke the senses. Show your viewpoint character’s vivid sensory impressions, so the reader sees, hears, smells, tastes, feels what he does. ~ Amp up the imagery. Use the most concrete, suggestive nouns and the most powerful, evocative verbs you can find. ~ Show inner reactions. Reveal your POV character’s emotions, brief thoughts, and physical reactions, starting with their visceral responses. ~ Use tight, staccato thinking. Avoid long, involved thought processes, which deflate tension and slow things down. ~ Describe physical actions succinctly, for fast pacing and high tension. Don’t get into distracting minor details about which hand or finger or foot and exactly how high or low, unless it’s important for some reason. ~ Show other characters’ threats and reactions through their words, tone of voice, actions, body language, and facial expressions. ~ Use rapid-fire dialogue. Avoid complete, correct, thoughtful sentences and lengthy discussions among characters. ~ Write tight. Cut out any little unneeded words that are cluttering up sentences and slowing down the pace. ~ Use short sentences and paragraphs, for a tense, breathless, staccato effect. – Writers and readers – do you have any tips to add to this list? Fortunately for Jennifer, the attacker was far enough away that when he attempted to grab her she sidestepped him and delivered a sharp kick to the outside of his left knee. He grunted and fell back against the stack of wooden crates. He then got up clumsily, rubbing his arm, showing his anger at how easily Jennifer had dodged and hit him. The attacker lunged at Jennifer. She dodged to the side and delivered a sharp kick to his knee. He grunted and fell against the stack of wooden crates. He scrambled up, rubbing his arm, eyes full of hate. His facial expression changed from one showing loathing to one communicating unrestrained joy. Jennifer realized at that moment that she had made a fatal mistake. She looked to her right. The door leading out of the warehouse was about fifty feet from where she was standing. His expression changed from loathing to amusement. Jennifer knew she had made a fatal mistake. She searched for the exit door. It was to her right, about fifty feet away. An inline skater came careening around the corner and skated fast towards them, shouting loudly. Josh shot a look back at Amy as he grabbed her arm and pulled her bodily to the edge of the street out of the path of the oncoming skater. An inline skater came careening around the corner and barreled towards them, yelling. Josh grabbed Amy’s arm and yanked her out of the way. Writers – feel free to add a before and after example of your own in the comments! 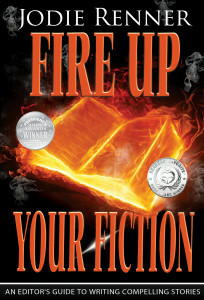 For more on this topic and on writing tighter, see Jodie’s book, Fire up Your Fiction. I took a break from first-page critiques last time around to make room for my friend and guest blogger Tom Schreck to give us some tips on hand-to-hand street fighting. Now back to my regularly scheduled blog. Today, I take a look at a first-page submission called CANNIBAL’S HYMN. My thoughts and suggestions are on the flipside. Fredrick’s knees and hands shook as he pulled his wallet from a back pocket, bumping his wrist on the Glock snugged against the small of his back. He extracted a business card and flicked the wheel of a cigarette lighter. On the seventh try, and after turning his back to the mouth of the cave, the flame stood upright and he set fire to the card stock. Crouched down, he tucked the curling paper into a small mound of dried leaves. His hands were turning white and going numb from cold and he could barely feel his toes, even though he slept with his tennis shoes on. I should have bought boots. Or better socks, he thought. 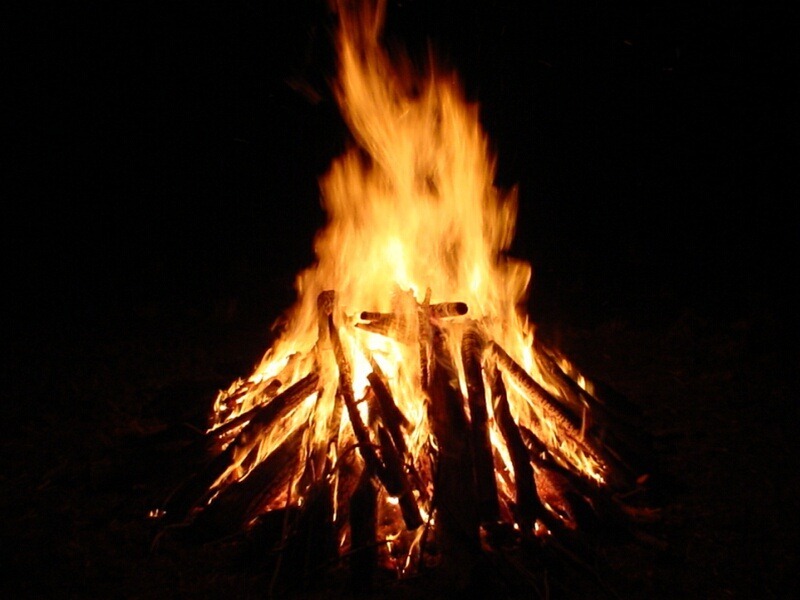 Shielding the infant pyre with his hands the wind blew across his back and dropped snow onto his neck. He shivered. He snapped pieces off of a branch and began laying them on top of the smoldering tinder. Tight, tiny pops gave way to less meek snaps as the fire grew. He blew steady breaths through pursed lips at the bottom of the fire. The horse clomped about, swishing its tail outside. Turning around Fredrick stared through the aperture of the cave towards the trees. The snow fell in orderly, regimented lines that seemed more akin to the static waves painted on community theater backdrops than real weather and his eyes began to lose focus, depth disappeared and the forest flattened into a single crowded plane of dark green, gray and white. Then, right then, a small voice opened fire in the back of his mind. He knew it was right. There was no way he was getting away. Everything was too far, the weather too hateful, too many people looking. He hunched over and crawled back into the darkness of the cave. Pawing around in the darkness he gripped his backpack and pulled it towards him. Setting the Glock to one side he reached down along the side of the bag and shimmied a collapsible aluminum bowl from the bottom and pushed it into shape. But the bottle of water was frozen. OK, here’s what I know so far: Fredrick is trying to build a fire outside the entrance to a cave. He is hiding from “people”. It’s freezing and he’s not properly dressed for the elements. He is armed. There is a horse nearby. He has come to the realization that he may not survive. After Fredrick starts the fire, he goes inside the cave to fetch a bowl and heat some water. First the good news. The writer has established two strong questions here that should keep a reader wanting to turn to the next page. 1. Will Fredrick survive the cold? 2. Will he avoid capture? Now the not-so-good news. This is a hodgepodge of mixed images and confusing staging. Some of the writing is illogical. And a number of things just don’t work visually. Here’s my line-by-line critique. Does this mean that the rest of his body parts did not shake? Why isolate the shaking to his knees and hands? bumping his wrist on the Glock snugged against the small of his back. Is “snugged” really the word to use here? Is it even a real word? It stopped me as I tried to determine if it was a typo. How about snuggled or pressed? He extracted a business card and flicked the wheel of a cigarette lighter. It sounds like the cigarette lighter was in the wallet, too. Unless it really was in the wallet, I would suggest clarifying that he removed it from a pocket or pouch or whatever. On the seventh try, and after turning his back to the mouth of the cave, the flame stood upright and he set fire to the card stock. This is an instance of staging confusion. Is Fredrick inside the cave and is shielding the flame from the wind blowing in or is he outside the cave and shielding the flame? Why would he turn his back to the mouth of the cave if he was outside? At this point, I’m not sure where he is. But I do know that building the fire outside in the wind makes little sense. The word “down” is not needed since it’s physically impossible to crouch “up”. The economy of words rule: deliver the most information with the least amount of words. “Were turning” is passive voice, and there’s no need to mention that the numbness is from the cold. What else would it be from? and he could barely feel his toes, even though he slept with his tennis shoes on. Why would he do otherwise? Sleeping with his shoes off under these conditions would be insane. I should have bought boots. Or better socks, he thought. Better socks? Like $100 silk dress socks? Instead of a meaningless word like better, how about thicker or insulated or woolen or hiking? OK, I admit that a “pyre” is technically a type of fire—a heap of combustible material, but it’s usually the size of a Rose Bowl Parade float. He may have high hopes that his fire will grow to the size of a pyre, but seriously, this is thesaurus-intensive writing. And it’s the wrong image to put into the reader’s mind. the wind blew across his back and dropped snow onto his neck. He shivered. He snapped pieces off of a branch and began laying them on top of the smoldering tinder. Now I know he’s outside the cave. So where is the logic in trying to build a fire in the wind when he could use the shelter of the cave instead? Tight, tiny pops gave way to less meek snaps as the fire grew. He blew steady breaths through pursed lips at the bottom of the fire. What other kind of lips would he use to blow steady breaths? And the way this sentence is constructed, the pursed lips are at the bottom of the fire. A cleaner version would be: He blew at the bottom of the fire. The horse clomped about, swishing its tail outside. The horse? So is it his horse or did the animal just wander up out of nowhere? Another bit of confusing staging. And it swished its tail outside. Outside of what? The cave? Turning around Fredrick stared through the aperture of the cave towards the trees. So is he now inside the cave looking out? And the choice of the word aperture is another example of thesaurus-intensive writing. Yes, technically, aperture is a type of opening. But the image it places into the mind of the reader is normally associated with the parts of a camera lens. Is Fredrick a photographer? I’ve never seen snow fall in regimented lines. If anything, it’s exactly the opposite. I’ve also never seen “static waves” painted on a community theater backdrop. As a reader, I can’t relate to these references. No idea what’s going on here. Is he on drugs? Hallucinating? I think one “then” should do fine. Opened fire connotes gunfire. Since we don’t know who Fredrick is yet, it would be easy to assume with this phrase that he is military and thinks in military terms. If he is, then this is probably OK. Otherwise, it might not be the best word choice. Too far as in distance or plot development? In other words, was the closest place to which he could escape too far away, or had pervious events leading up to this scene gotten too far out of hand? Hateful is normally a human emotion and may not be the best word choice here. Unless the author intends for the weather to become a contributing “character” with human attributes (think OLD MAN AND THE SEA), I would suggest words like harsh or severe might be better. A slight clarification would help here and ratchet up the suspense. Rather than the generic word “looking”, how about something more intense as in, too many soldiers out to kill him or too many cops out to capture him or too many villagers with pitchforks hunting . . . Obviously I don’t know the story, but I think this is a missed opportunity to create tension. And if so many people are searching for him, wouldn’t the smoke from the fire attract their attention? He hunched over and crawled back into the darkness of the cave. OK, so he really is outside the cave. Pawing conjures up the image of the actions of an animal, not a human. That may be fine if the writer wants to start planting seeds in the reader’s mind that Fredrick is someone with animal-like instincts, despite the tennis shoes and bad socks. he gripped his backpack and pulled it towards him. Setting the Glock to one side he reached down along the side of the bag and shimmied a collapsible aluminum bowl from the bottom and pushed it into shape. But the bottle of water was frozen. Again, the staging is confusing. Where did the water bottle come from? Like the horse, did it materialize out of thin air? A short clarification avoids confusion. As we’ve said many times, it takes a lot of guts for a writer to submit a sample for a public TKZ critiquing. And I have the utmost admiration for the courage of anyone who does. At the end of the day, this exercise is all about helping a writer become better at the craft. This submission is not bad at all, but it needs a great deal of clean-up and revision. I get the impression that this is probably a really cool story. The writer needs to decide what images to plant in the reader’s mind that correspond closely to those of his own, and avoid confusing alternatives. Probably the biggest sin committed here is questionable word choice. The words are all a writer has to get the story clearly into the head of the reader. It’s not easy. If it were, everyone would be writing books. Hey, wait, come to think of it everyone is. So I hope that this writer will take my comments and sometimes snarky suggestions as a means to improving skills. It’s never personal. In fact it can’t be because I have no idea who wrote this submission. It’s always about advancing the art of story telling. Good luck. Any additional thoughts? Do you agree or disagree with my suggestions? Would you keep reading?